Thank you for this. I had been considering getting Clear up here in Philadelphia. Eff that noise. they can be good…but that signal even when strong can drop out to nothing. What’s the URL to get your bandwidth history chart? You must be accessing it through a Clear modem, and you have to log into your account manually first. When did Clear start implementing this? Their latest lying POS Acceptable Use Policy (www.clear.com/legal/aup) is dated June 9, 2010. But I don’t think they’ve been throttling like this since June. This is clearly NOT what they’re doing. Right now it’s Midnight, and they’re throttling me. Those airwaves must be really congested right now. File a complaint. In fact, I’m actively searching for a class action lawsuit to join, because I signed up when their website said this, and I am being throttled to high heaven all day long every single day – even at 2 or 3 AM! T let me know if you find anything about a class action lawsuit..Ive had Clear since april and never had a problem…but in the last 5 months my internet has been very very slow.I didnt suspect throttling till i saw a complaint on Clears forum. Ive called Cust service on several occasions to no avail, they tell me that Clear isnt capping my internet that its congestion I say thats (bullsh@#t).Needless to say Im so pissed off Ive even threaten to sue them. I find it funny that Comcast has put their greedy fingers into Clears pie and now Clear cant produce what they advertise. I pay $45 a month for unlimited usage to the internet Up to 10 mbs ive never went passed 1.4mbs i didnt complain about that figuring i am on a laptop and its wirless, but now i get a worthless .24 to .60mbs. I mean come on if your going to throttle peoples internet why make so blantant. I say we SUE the corporate greedy bastards!!!!!! LMK too! I have had Clear for about a year now, and although I am not as knowledgeable as the other posters on this issue, I know that their promise of fast service, allowing you to watch video, etc, it is a lie, and their service is really not “fast” or any of the other things they promise in their ads! I will be quick to join any class action lawsuit! I am in B-more as well as the author, I have been with Clear for about 3 years now or close to it. Ever since I signed up, the service has never been what I would call fast. In general, I use Netflix, YouTube, basic web surfing, and I used to play a lot of MMO games. Now that may sound like a lot, but it’s not like I was running bit torrents or anything. No Napster or iTunes or anything else that would cause a lot of traffic that wasn’t “regular use” as is regular for me and I am the one paying for it after all right? Plus, I have the highest paid plan available for the mobile modem, 3g+4g and yet still lag in games at the best of times. There has only been throttling 3 or 4 times, but when it did it made the service USELESS and it was always when I made a major change to my system, purchased a new PC & had to re download all the game clients or if I wanted to upload a video to YouTube [which took FOREVER btw.] Then, like everyone else the speed dropped to 0.24-ish, and stayed that way for 1-2 weeks! Cummon, seriously? Now, I am fortunate because I discovered that a local bar has public WiFi for their customers & they have Comcast Business according to Speedtest.net. I use it most of the time now unless I need a more secure connection because the WiFi isn’t always as stable when gaming. However, the speed is around 8-10mps compared to my Clear which is only 1.77 Down & 0.78 Up currently and I haven’t even been using it AT ALL in the past 2 days!! Pathetic since I am paying $55.00 for the full shebang yet, Im getting better service from the local pub for freebees, does this sound right? One more for the class action LS pls. I call the customer service and the story I got was that “the system” determines who/when a person is to be cut back and they have no control over it, I said, “..but it’s unlimited?” She says, “Yes, it is unlimited* but, your using too much so the system automatically attempts to balance it so it is even for everyone.” I said, “..but I pay you for an UNLIMITED service by the month, not as long as the system decides it’s balanced!” I could hear the derp, on her end, they’re wrong and they know it. By George she finally just got it! I am being throttled 24/7 also. Right now ).50 is great for me. Ironically, I just this afternoon was at a friends house and he has used 44Gigs since 3/4/2012 this is being posted on 3/15/2012. His speeds according to speedtest .net were over 10.0Mbps!!! With a one day usage of over 11Gigs. Midnight isnt particularly off peak, at least in the old days with (telephone)modems the number of users didnt completely drop off until 1-2am. Today after seeing (and verifying) the 26KB/s rate, I called clear. After 2 or 3 operators who lied saying there were no bandwidth restrictions, especially as I requested verbatum a check to see if a limiter flag was tagged on my account, they fired me off to the final tech support. After an hour of bandwidth testing, she went to talk to a technical lead (I assume her manager). She came back saying a ‘limit’ was tagged to my account so that other users would have a ‘fair share of use’ on the account. NO WHERE in their documnentation for their ‘unlimited access account’ does it say any type of limiting what so ever except for ‘abuse’ which would be considered 24/7 usage. My wife’s and my usage? Netflix on XBox live, playing an online game 4 hours a day between both of us, and casual web browsing. If this is ‘abuse’ that tags their 26kb limit, then frankly any casual user of the internet will be hitting it. Oh, and the sweetest thing about this? They said the limit is usually ‘only’ a week, maybe two weeks, and then network is restored. Why the hell would I use an internet provider that offers ‘unlimited access’ when 2 out of 4 weeks you’re stuck at modem speeds? No thank you, I think I’ll go with Sprint. This is a transcript of a conversation with a rep. from their company. Notice that they deny the throttling. I change the rep. name because she/he is not guilty. It is the decision makers’ fault. Hello Ricardo. Please wait while we find a CLEAR specialist to help you. You are a new customer with a Tech Support question. You have been connected to Clear Rep.
Clear Rep: Hi Ricardo! I’ll be happy to help you today! Ricardo: My questions is whether you throttle users that use lots of bandwidth (e.g. Netflix users). Clear Rep: We do not throttle the service. Ricardo: Ok, so if I get your service, you guarantee that I won’t be throttled for my bandwidth usage (I watch movies on Netflix), right? Ricardo: Ok, besides for location and interference, you can guarantee that Clear won’t purposely limit my bandwidth, right? Ricardo: Ok, sorry to hear that. Thanks anyways. BTW, I decided not to take the service after looking at this post. i esperar 15 minutos para hablar con el agente de ventas. agente de ventas debe ser primero. ¿Cómo se apoye? Just got off the phone with a Clear supervisor who informed me I was being “managed”. I was clocked at a little over 100g a month of data and they capped me at about .6mp/s. I was told if I only checked my email and watched maybe one or two youtube videos a day.they would take off the cap, but I can not use my internet for anything more or they would put it back on. This is of course right after upgrading to the fastest modem and upgrading my bandwidth. So… what exactly am I paying for? With four people that avidly use the internet, this just does not work. Dont’t really appreciate being scolded for using a service I am paying for. I am retired. I have found a new hobby. I now respond to as many clear “forum” customer complaints as I can. Oh yea, I’m stuck with clear for the mean time. I run speedtest every day and post it frequently with my “F-” rated connection from clear you can guess what the drift of my message is to clear. I have filed a Form 2000A deceptive advertising complaint with http://www.fcc.gov/cgb, the FCC, and have received corespondence from Clear Corporate VP for Regulatory Affairs. I suggest frequently for clear customers to do the same. At least we can get them to use up a couple of reams of paper, envelopes, and stamps with the replies. Clear offers a lesss than truthful presentation of their product. Everyone should do their part to seek compliance with FCC regs. When I first got Clear I could stream my Slingbox easily. Lat week I loaded a large torrent (8gb) and BOOM! Slingbox is so slow it’s unwatchable. Speed test still shows 1,5-2.0 but they must be specific on what they block. They told me if I turn it off for 2 hours, the device will then reset back to normal. I Doubt it but i will let you know what happens. Seems like they are throttling alot of customers lately and they are getting high call loads. Unfortunately doing this just leaves me to cancel their project and go with wired because I cannot continue this level of service. Downloading some ISOS alone for work and business takes 15 gb right there into 1-2 days. By the way, turning off the Clear modem for any amount of time has no effect beyond getting you closer to reaching the end of the 1 week of usage history Clear retains regarding your account. They admitted to me it’s 5 gigs per day that is the magic number. That kicks in what they call equalization. Ask them to reset the modem. My connection immediately jumped from around .3 mb to above 1mbps. On good days from clear I may get 2 Mbps if i’m lucky. They admit that in my area the tower is congested. They just start counting again though, when I break the quota it’ll trigger the throttle. I don’t know if I want to have to call them every week. They definitely don’t want me as a customer. And my congested tower will probably only get worse as customers come online. I thought I heard that they aren’t building any new infrastructure until they switch from wimax to LTE. they decided to put in a support request on the tower instead. Allegedly will follow up with me in 2 days and will issue a credit for 4 days of service (as if $3.25 is any consolation). Please, oh please somebody get a class-action suit against these people. I have had the exact same problem, but when I called today, I was transferred to a pre-recorded message that basically said they were aware of problems in my area and were working to resolve the issue. A second call, after just pressing zero to actually get a real person, I was scolded for my high bandwidth usage, told I was being “managed” and all the same crap they told the other people. THIS IS NOT UNLIMITED USAGE. It is an absolute LIE. These big companies think they can just push consumers around with no consequences. I think soon they will learn. They are certainly about to lose my business. Ditto here, my bandwidth is slowing down, never going above 1Mb. We can’t watch Hulu and Netflix at the same time. I’m thinking FIOS is a better alternative at this time. 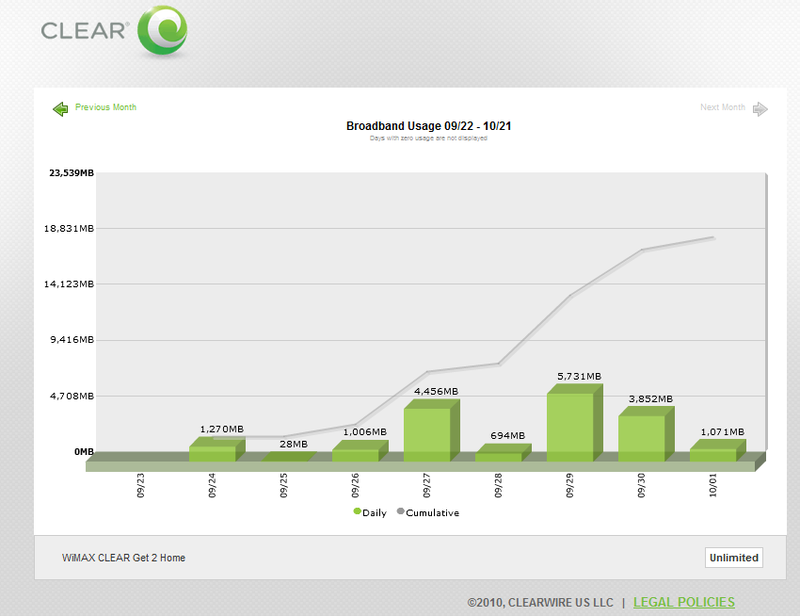 Clear’s customer support is extremely poor, but if they throttle, they won’t go the distance. My experience with them has been good and extremely bad. No one has ever figured out a way to help me put a password on my home modem. I’ve used three modems so far and replaced the mobile one once. It’s not stellar and there is a lot of room for improvement. In the meantime, I’ll check out other services. I don’t think it makes any sense to get mad at companies. We just need to give them heat by using their competing services. I think you guys are over-thinking Clear and their capabilities as an ISP. I don’t have a cable TV provider at all right now, my entertainment is solely Netflix and Hulu. Clear’s bandwidth for me is pretty random, maxes out at a little over 10 down (late at night usually) and spikes and dips all over the place the rest of the day. Except for between 8 and 10pm…when its reliably as slow as dial up….can barely even listen to Pandora. I don’t think any of us are “throttled”, we are simply at the mercy of bottlenecks from a mickey mouse isp. Get FIOS if its avalable to you. I think the evidence presented here adequately demonstrates that this is not the result of simple network bottlenecks. For the past 3 months, the service has been throttled badly. It seems Sprint doesn’t know what to do with them. I can no longer use Oovoo.com (a great Skype alternative). I have to let them go. I signed up for Verizon again. I would have done Charter but after what they did to me, no way. They admit to restricting usage on their legal page. They told me 2 GB’s a day, but I find the cap is even lower then that when spread out throughout a month. They have me on a hook though, every other ISP involves buying basic cable, or having a land phone line. I thought Clear was the salvation from phone and cable rackets I was looking for, I guess I’ll swallow the data caps, they upped the throttled internet to 1mb/sec download, it’s workable, just glad I don’t do any online gaming anymore. I use video conference for work and it got so bad I couldn’t even work from home anymore. I had to go back to Verizon. I did write the California Attorney General about how Clear advertises everywhere NO CONTRACT, but there is one. I just cancelled my account due to the throttling down to as low as 0.17 Mb/sec. I called them but they could not give definite numbers for allowed usage. If you use Speedtest and your download is lower than you upload speeds, you are being throttled. I went back to Verizon DSL and I can now use Oovoo. Clear is shooting itself in the foot and aiming for the other. I don’t think they’ll be around for another year. Sprint is getting tired of them. just got done talking to a rep, I am being throttled because i abuse service by watching netflix everyday. I speedtest every day and only get .6 mps like clockwork. I really wish i new about the throttling before i bought this so called “unlimited usuage”internet. What a dishonest company. They are highly dishonest and I hear Sprint doesn’t know what to do with them anymore. I took the time to write a letter to our state attorney to voice my complaint. Everywhere it says “no long term contract”, unfortunately, as soon as you activate your modem, it locks you in a 2 year contract. It’s unimaginable a company can do something like, claim no contract and lock you in when you use their services. It’s blatant. Watch a class action suit soon. I was also told to watch only 2 movies instead of 5. I told her I watched less than 3 shows a day. That company won’t survive another year. well they are still at it. I guess they found a different way to stop usage. Clear sent me an email telling me I am going beyond their acceptable usage policy. They sent me one feb 9 and then another feb 29 and they another two days ago. The funny part is the clear spot been broke since the 29ths email. They really should inform people that their service is not really unlimited. The company won’t be around for long. There’s no growth in their product, they are not very active and the tech support service barely got better over the years. It took them 10 months to replace three modems, and one mobile. Advertizing no long term contracts everywhere on their site, it’s only when you actually set up their modem that it locks you in a contract. That is complete deceitful advertising. That company is headed nowhere but a dead end. I dumped my cable TV in favor of watching video online and within 2 days I started being seriously throttled to 0.25MBs. Even before this my voip phone didn’t work that well. I was an early subscriber and locked in a lifetime rate of $50/mo for both a home model modem and a USB dongle with the “unlimited” data plan. It’s a great deal but I just can’t take the poor quality anymore and am going to dump them and return to Time Warner cable modem and give up the roaming. I wanted to like them but this just won’t do. I bought the equipment outright a few years ago for ~$200 in return for not having a contract. Wonder if I can sell it? Speedtest.net speed test: at best 0.66 mbps, basically 56k modem speeds. Not satisfied at all with Clear. I go month to month, no contract, and will switch to Cox Cable next month. I do alot of Netflix, Blockbuster, and Youtube, download some movies too. And Yes, Clear admitted to me they cut back on my bandwidth during peak hours. If i’m gonna pay 30 a month through Cox Cable, compared to the 25 i’m paying now…its worth it, if downloads happen faster. Clear blatently mis-advertises. If anyone knows of a class action suit going against Clear Movile Internet, please leave a reply in this forum. My first month ends in a few days. I hope it resets at that point. I’m glad I moved away from them at the beginning of the year. They Clearly don’t have the infrastructure to accommodate the clients they take on. I went back to Charter and peak at 20 Mbs with 15.5 as an average for… $30 a month on a special 🙂 Who needs shoddy service, lipservice and blantant twisting the truth marketing? And when they say “no contrct” please read the fine lines. There is a contract. They lost the notes of the support techs I spoe to, said they never told me this, lied, lied and lied. These guys are untrustworthy at every level. Run away!